They say nothing can be finer than a night in Carolina but I disagree. When it comes to romance, why not go out on a limb? Bark up the right tree and enjoy a memorable night in Big Five territory. 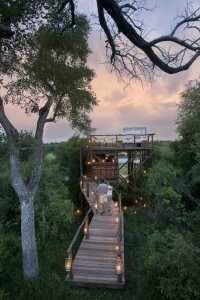 Celebrating our anniversary atop a high wooden platform under the stars in the Kruger Park turned out to be a wild experience for my husband and me. In some places, the branch balustrade surrounding Tinyeleti, our triple-decker forest ship, seems to have been gnawed by a sharp-toothed predator. “Probably a leopard,” surmises my husband, but this only adds to the thrill as we toast each other with the champers chilling in a silver ice bucket on the table set for two. 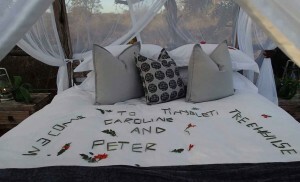 Mosquito netting shrouds the bed like a bridal veil, a twig message welcomes us by name, and paraffin lamps glow. From our lofty perch we become part of the wilderness – proudly primate, mammalian, one with the savannah and high-pitched hoots of a Scops owl. 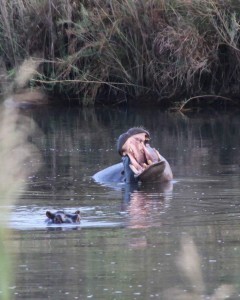 A hippo shows formidable tusks. Through the telescope, the hippo seems alarmingly close and a frisson of fear snakes up my spine for the first time. Our ranger Raymond Themba had long driven away with a cheery wave and a warning not to undo the latch. The only thing protecting us from nocturnal predators is a torch and a two-way radio. But, how stunning is the diamond-encrusted celestial canopy! 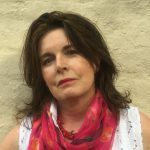 The waning moon – guest of honour at a star-studded party – arrives late, illuminating the shivering, white torsos of knobthorns stripped naked by the elephants. Later, soft rain refreshes our upturned faces but that’s not what awakes us. Something is rooting around the remnants of our dinner. Cutlery clinks on plates, a knife clatters from the table. We shine our flashlight and a genet darts away, leaving only paw prints on the linen tablecloth. It’s a fitting finale to such a memorable night! Take a bough! Tinga Lodge in the Lion Sands Game Reserve opened a new family suite in August that accommodates children from the age of six, and sleeps four guests.